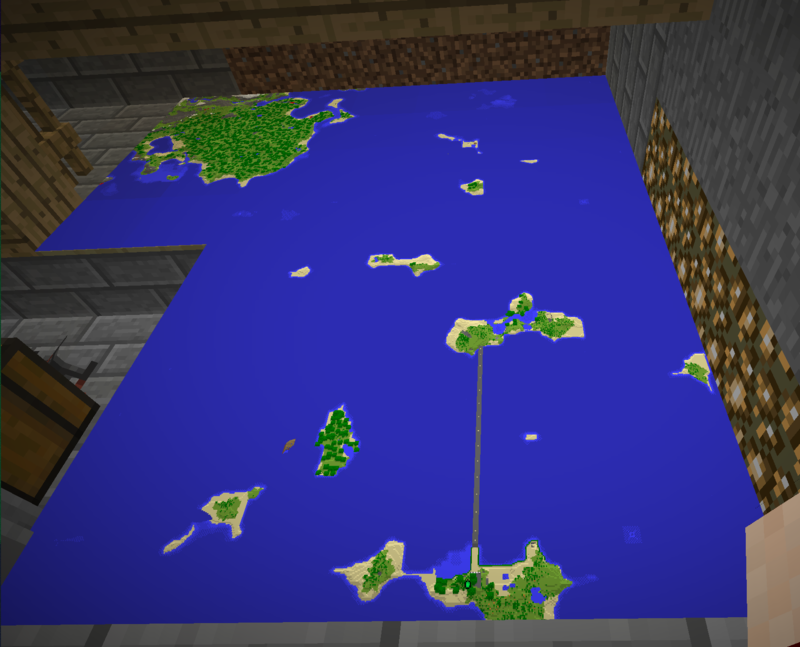 While we wait for an on-line map to be available, I thought it would be nice to have a big map wall either at spawn or by the nether hub, to give a general idea where everything is. A temporary map wall has been set up at spawn, and players are invited to help fill it in. At the moment a 4x4 grid is being set up, I'll expand it if this project is successful. Each map shows an area about 1000 blocks to a side, so it's okay if a panel takes a few trips to complete. If you'd like to help with the mapping, just take one of the map panels and go explore the area it belongs to. I'd suggest taking only one panel at a time, and returning the panel to the wall before you log out. With everyone helping, the map should be finished quickly, and we can decide where to put it. P.S. The panels are labeled to make replacing them easier. It's a little distracting when viewing the big map, but don't worry, the labels can be removed later. Is overviewer available for 1.13 now? I can't really tell. Maybe? This thread seems to be the one to follow. I have no expertise at all in computer science or coding, so I can't figure out if there's a working version. It sort of sounds like it, though. In the meantime I'll check out the map wall! It is currently being worked on, not out yet as far as I can see. It's still WIP. There are some hacks out there that take a long time to render, but nothing official. I did find an offline map renderer (i.e. I have to download map files and manually do it). I did some tests and it seems to work well. It reveals the entire world though. So, after seeing the map, there wouldn't really be much exploration left to be done, except for villages and such. Would you like me to upload that map? Is it possible to limit the distance that it renders? In the same MR that @cowslaw posted, it looks like some limited form of overviewer support is available if you're willing to try that. I'd tentatively vote no on the full map reveal, but I'm fine being outvoted if people just want a map already. The best aspect of the map was being able to plot down signs to mark and know where everything and everyone was. That and seeing yours and others building progress. I'm fine with waiting out until overviewer properly updates. I don't think a pre-rendered map will give us much. Let's wait then until Overviewer matures and has reasonable performance that doesn't impact the server. In the meanwhile, if you come across something else that looks like it might work, let me know and I'll take a look. Development of Minecraft Overviewer for 1.13 is progressing very slowly. I found a windows version of Minecraft Overviewer for 1.13 on Github (via the link Cowslaw gave earlier in this thread). I tried it out on a small test world and it mostly works. Some blocks are not rendered correctly and it is slow. This version is about a month old now (couldn't find a newer version). Out of curiosity I have just started rendering a copy of the Innsmouth world (MC 1.8) that I had converted to 1.13. 2018-10-10 09:41:54 Welcome to Minecraft Overviewer! (As seen above the ETA for rendering decreases faster than real time for a while before settling down. Any news on this? Inquiring minds and all that. Just tried generating an overview of a new world, using the build mentioned here. It was fairly slow, but it did produce a completely functional result, though I did not test it by placing any of the new blocks. Either way, the original PR has yet to be pulled into the repo and there is a handful of new PRs open, including several issues regarding the new file names. The last commit to the 1.13 branch was on November 26, so it's hard to even estimate when it will be finished. At least there is some progress. It's a good sign. Thanks for attempting it cowslaw! It's been installed and map generation is currently underway! It will take several hours to map the already explored world from scratch though. During this time the server performance will be affected. It's also likely that I will need to tweak things and run the mapper again. Stay tuned. A partial render is up. I'm having some trouble with the mapper crashing, but I'm working on it. The map looks awesome! Oceans are so pretty now! Thanks for getting the map up and running. Looks like the mapper is running smoothly now. Let me know if you see any weirdness. Asum could you check the backup routine. It is a long time since I noticed it running. Everything looks good. Logs show normal operation and the files are up to date both in the temporary backup folder and on Amazon S3. the only funny business I can see with the map is that it looks like stairs are not rendering their correct orientation, but that's more of a dev problem I think. Thanks Asum. I guess I just wasn't on when backup was taken. Mempo: I too noticed a few strange things. Some blocks seem to be rendered at the wrong position. It's noticable at my place (the lake and the corner of the tall building). No big deal. I expect such things will be fixed by the devs eventually. They just had to completely overhaul their entire project, I'm sure they'll fix block rendering glitches like that in due time. I'll keep an eye on the Overviewer development and update the server as new updates come out.